Featuring 22 Gold and Platinum songs recorded by both stars and undiscovered artist from around the world. For more than 25 years HousTone Records has released LP/CDs, from the fields of Rock, Jazz, Classical, Blues, Country, New Age, Reggae, Worldbeat and R & B.
Timeless Classics VOL II Continue, features many of the worlds greatest songs performed by stars and virtually unknown artist. “The real reason that some artist become stars and others with the same talent do not make it is Luck”! If you Love music you owe it to yourself to check out these artists many who have not been as lucky; yet! One of the key elements in HousTone Records signing, processing, selecting and distributing artist’s products is, the artist must agreed to record for the CD two well known cover songs. This allows the artist music to be judge by fans for the talent they have, from the music they know. 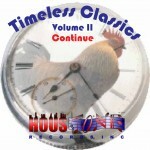 Some of the artist on the Timeless Classics Continue Volume II compilation, or Air Supply, Lonnie Gordon, Pretty Lights, Small Faces, Betty Wright, Blaque, Céu, Herbie Hancock, Malik Adouane, Shirley Horn, Half Pint and other great artist. The Continue CD features Jazz, Rock-a Billy, Dance, Ballads, Blues, Classical, World Beat, Latin, Reggae and is just some of the styles that or well represented on the CD. HousTone Records does not except unsolicited material. Artist can submit a request to have, 3 songs reviewed and one of the three must be a well-known cover song. Submit request by E-mail only.